Staff from the British Council, EnglishUK and agents from abroad visited English Language House on 5th October 2017. Chris and Tatiana took them on a tour of the city and the surrounding countryside, showed them around our lovely building and introduced them to students and staff at ELH. The agents looked around the school, observed some lessons and had lunch with ELH students and staff. It was a beautiful, sunny day and we all had a lovely time. We hope our visitors enjoyed their day with us and will come back again soon. 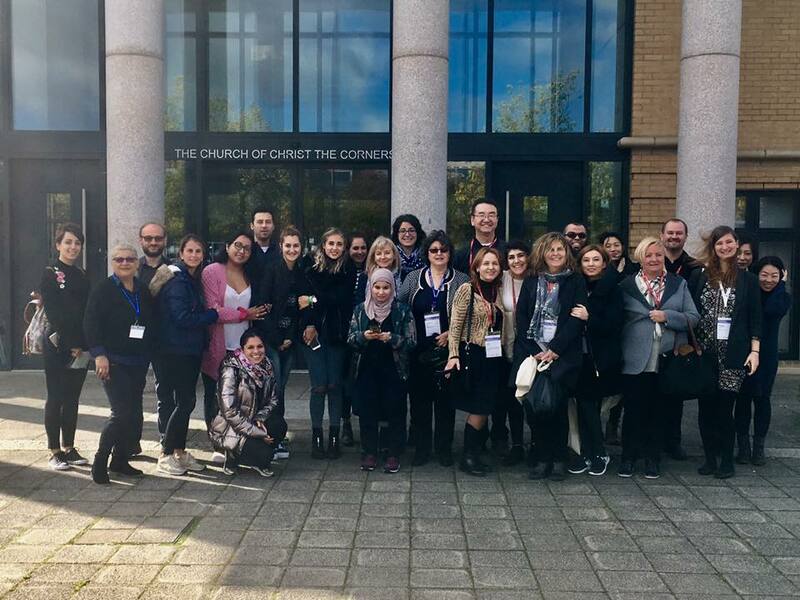 Chis and Tatiana went to StudyWorld at the QEII in London in September 2017. They met many interesting people from all over the world and spoke to them about how fabulous it is to live and study in Milton Keynes. The QEII is an exhibition centre in Westminster and is very close to Big Ben, the Houses of Parliament and Westminster Abbey. Here are a few photos Chris and Tatiana took while they were there. ​Congratulations to our first winner Eva who posted this lovely photo on our facebook page in January 2017. The photo was taken at Oakridge Park and Eva has won a FREE 5 week Conversation class at English Language House. English Language House celebrates 50 years of Milton Keynes with a monthly competition open to all students to win FREE and Discount classes. In February we celebrate Valentine's day and Shrove Tuesday. Google these two celebrations to find out more. Then take a photograph of either a food that is typical for one of these days, or a place in or near Milton Keynes where you can go to celebrate on one of these days. Add your photograph to this post at https://www.facebook.com/elhuk/ and comment to tell us about the photograph you have posted and why you chose this. The best photograph and comment will win a FREE course. This year Milton Keynes is 50 years old, the church of Christ the Cornerstone is 25 years old and English Language House has been in the church for almost 20 years !!!! To celebrate 2017 English Language House is running a competition each month where one lucky student can win a FREE course for 5 weeks. In 2016 we celebrated Shakespeare and ELH students filmed scenes from Shakespeare's Romeo and Juliet. ELH students met in February 2016 on Thursday 11th to find out more about Shakespeare and practice lines from his play "Romeo and Juliet". Then on Saturday 13th February 2016, students met for morning coffee and croissants at ELH and after a dress rehearsal in different locations students filmed some scenes from "Romeo and Juliet". The video appeared in China and scenes can also be seen on the EnglishUK website. The Language Show took place at Olympia from 14-16 October 2016. Tatiana from English Language House gave a talk on Friday 14th October from 17.00-17.45 about the CELTA teacher training course. She taught a foreign language lesson and answered questions about training to teach English to international students as well as about teaching and learning English in the UK and abroad.